Okay, Captain Black never actually said it but he certainly channeled his inner Auric Goldfinger during almost every encounter with his red-booted nemesis. And in his own increasingly cadaverous way he, like us, expected him to die in spectacular fashion. As Maximus in Gladiator suggested, we were always suitably entertained. The many bloodless deaths of the man that Death always took the day off for. 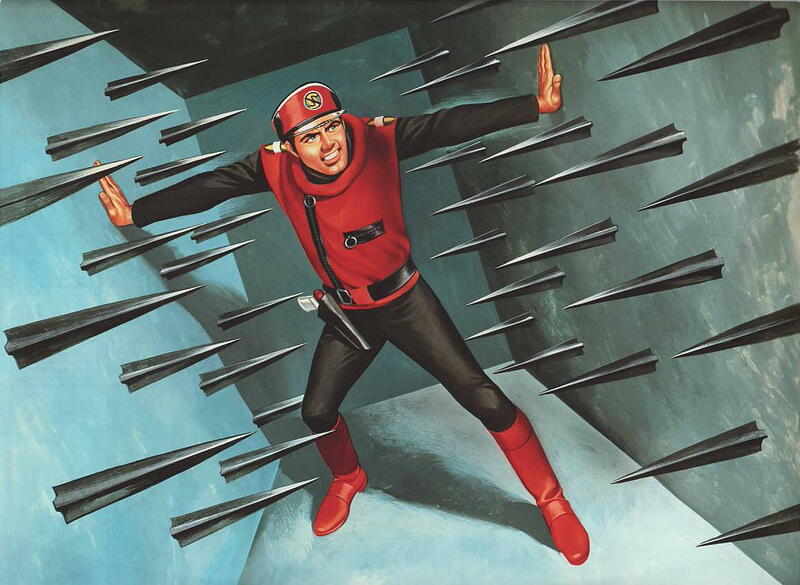 Consider the closing credits of the Captain Scarlet television show; that amazing series of paintings by the artist Ron Embleton which lay beneath the production credits. Each one a fantastic story in its own terrifying right. 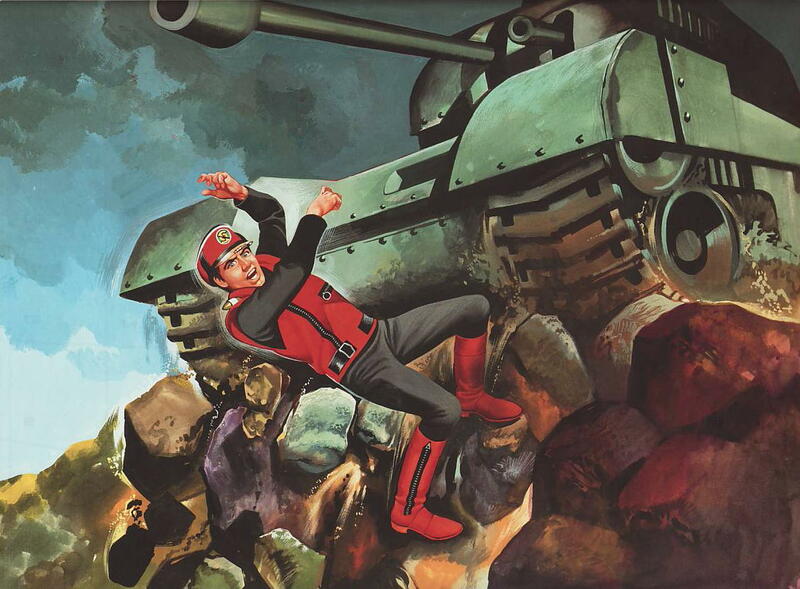 In them, Captain Scarlet was crushed under a rock fall. He is seen sinking into a luridly glowing green swamp while he desperately reaches for a jungle liana (a scarce sight these days, like rope canyon bridges or unexpected pits of quicksand in the middle of a busy high street.) which remains tantalizingly beyond his grip. Gaining no purchase in the swampy matter he is surely going to a grim end at the bottom of a lost lagoon. He also falls from a tall building and faces being burnt alive by exploding oil drums. Walls are closing in on him with spikes, which will perforate him even as the walls crush the life from him. A huge battle tank on some distant battlefield is about to roll over him either squashing him into the earth where he will suffocate or breaking every bone in his body. 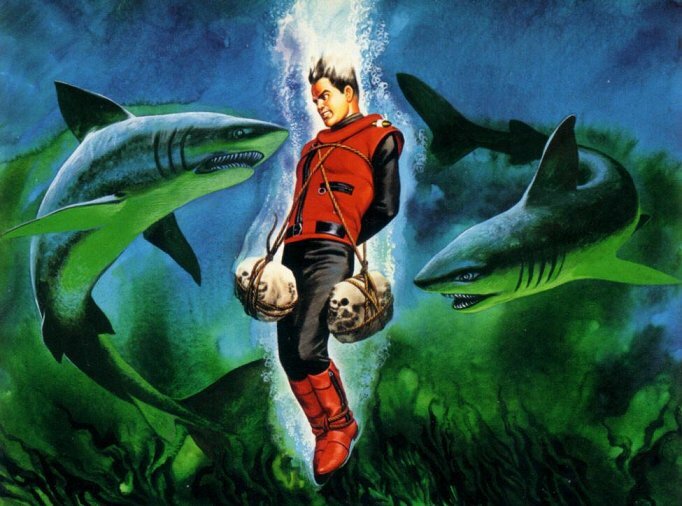 He is weighted down with rocks as he plunges into shark infested waters where he will either drown or be eaten alive. There were ten different images and each one represented a different gruesome end for our well-dressed hero. A weekly dose of a terrifyingly different death each episode for a man who could not and would not die. Is this not entertaining? I had at this point spent a few years absorbing the lore of Doctor Who and the revelatory on going history of my favorite fictional character. In those far off days the notion of Galifreyan bodily renewal or “Regeneration” had not been properly established in the loosest possible definition of the word “properly” off course. The invention of canon as it went along, regeneration being the great Deus Ex Machina which has allowed the much loved Timelord to literally regenerate for new generations of viewers. Captain Jack Harkness, that other great undying Jack, was probably less than a twinkle in the impressionable eye of a young Russell T Davis (Do not mean to make him sound like a self-created forerunner to himself.) No, Captain Scarlet was more like Joseph Campbell’s ‘Hero With A Thousand Faces’ except all the faces were the same one, over and over and over again. It should also be remembered with regard to the first transmitted viewing of these stories that in those far off days of telly viewing that it required ones full attention when watching. The idea that anything seen on television would be seen again was mostly woolly wishful thinking. I am quite sure it would not have occurred to ninety-nine point nine percent of those watching that there would someday exist a home format that would allow one to watch, record and review their favorite programs. A format that would allow one to pause, rewind, fast forward and even erase if the mood took. This was the stuff of science fiction, as though the space age family The Jetsons had moved onto Coronation Street, robot servant and all. So as a child I gave my full attention to whatever television show I was watching. My siblings, my friends and especially my ma and da would complain that while I watched television, the house could burn down around me and I would not notice. Even at a young age I found this an unrealistic degree of expectation regarding my worldly responsibilities. After all what did reality have to do with me and my very limited abilities You might as well ask a goldfish about the levels of clean water contained within the confines of its bowl. Things just were and things just are. I picked up a certain skill while watching a Carry On movie that has stood me well all down the years when it came to storing information in the ramshackle awkwardly Catholic archive that passes for my brain. In the movie Carry On Spying a young Barbara Windsor (or as she was called in those days; Barbara Windsor.) played a British secret agent with a photographic memory. Something which came in very handy when carrying out her profession as stated in the title. She would engage her ability by staring wide-eyed at a desired document then clicked her eyes open and shut mimicking a camera shutter lens opening and closing. Clickety click. It was probably someone in the Carry On production team taking quite literally the description of a “photographic memory.” It made for a quirky and easy to copy endearing characteristic. Good old Carry On team. The world needs your daft laughs now more than ever. Apologies for going off topic just then, it is that ramshackle awkwardly Catholic archive I mentioned. Trying to follow a train of thought becomes like following a round of crazy golf. I freely admit that this process does not actually work for me the way it worked for young Barbara Windsor. It did however serve to help me focus and recall in some detail images or pictures that interested me. It was the exercise of staring with determination I suppose that did the trick. It came in handy for remembering the series of images that played out beneath the Captain Scarlet end credits. These were a series of images worth recalling in vivid detail. So that I might discuss in some detail later with my pal Fergie how the good Captain died off screen in much more violent visuals and with a superior budget than during the actual episode. It seemed no less real to me or non-canon as comic strips and stories in annuals might be considered. “Captain Scarlet, he’s invincible” Me and my chum argued if this was indeed the case as these drawings would certainly make one believe. You fired a bullet from a gun at Superman and the bullet would bounce off. You fired a bullet at Captain Scarlet and the bullet would enter his body with extreme force, bounce around inside doing masses of internal damage and then exit leaving in it’s wake a gaping wound garlanded with dripping gore. Oh yes we talked like that as kids. As two Belfast boys who had grown up in Ardoyne, Northern Ireland, during the very worst of The Troubles. We discussed much grimmer things as well as Doctor Who, Universal Monsters, Lost In Space, Land Of The Giants, The Time Tunnel and er…The Singing Ringing Tree. 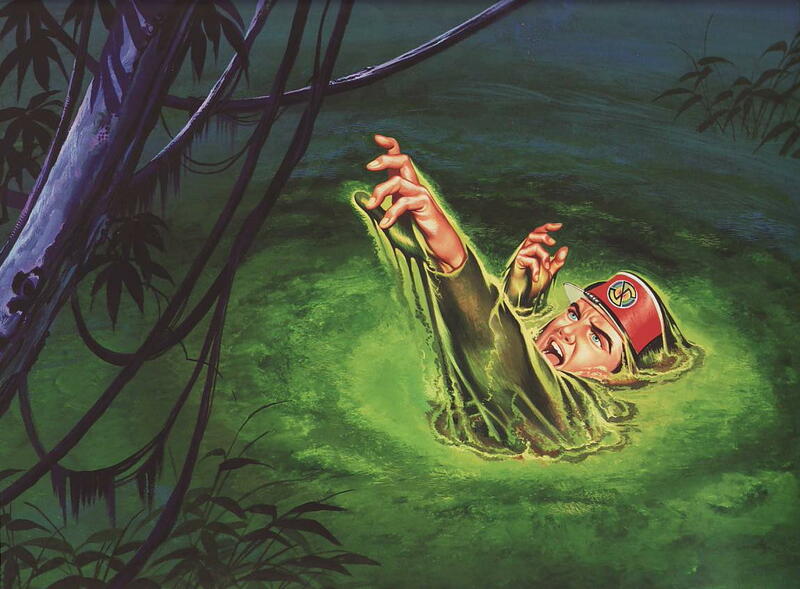 The perils of Captain Scarlet are the stuff of pure pulp adventure. From the closing spiked walls to the swampy, swallowing quicksand. Death came by shark bite or perhaps beneath the granulated tracks of a tank. They are old school deaths scraped off a colourful penny dreadful palette. Each variant is a powerful image that is as cinematic as it is dramatic. All down to the powerful paintings created by the artist Ron Embleton. They are as powerful in story telling terms as anything to be found in the well remembered and highly regarded in the realms of the fantastic as the Mars Attacks trading cards of the proceeding generation. They are as crafty, punky and timeless. And a sequel series is well past considering. Previous article Vote for the International Rescue Corps! A freelance Artist and Film-maker based on a not so secret island in the East Atlantic. Grew up up on the Anderson series reruns in the 90s and have always strived to create works that are as interesting and exciting. 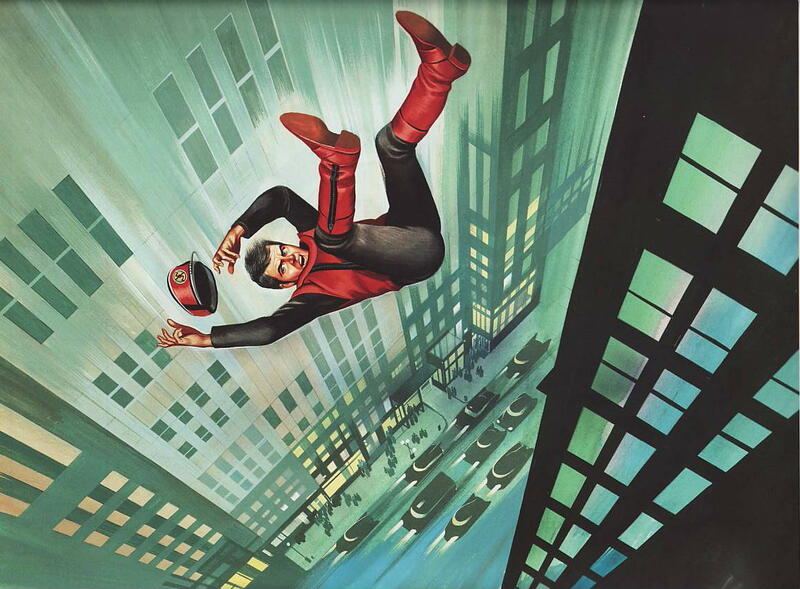 Captain Scarlet Volume 1 Blu-ray available to order! Spectrum Hovercraft Model available to pre-order! Evolution of Icons. Discussing the Redesign of iconic vehicles.